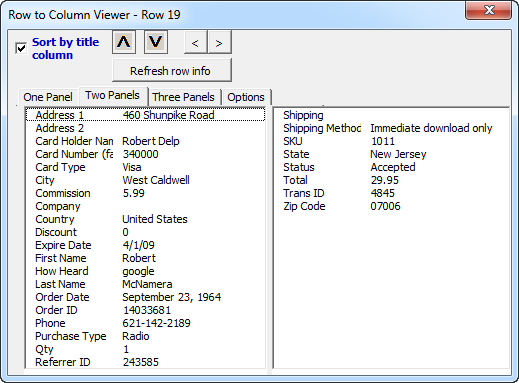 The Row to Column Viewer add-in for Microsoft Excel helps you view all the data on a row with just one click. You can see up to 150 row entries at one time! If you prefer, you can have the data sorted by the title row so data is even easier to review. 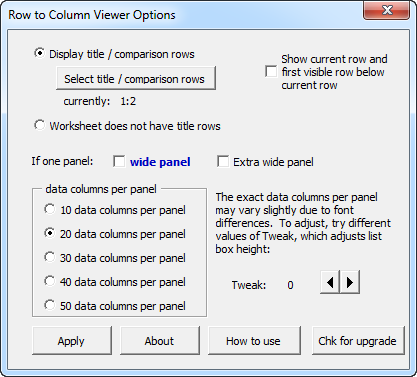 If you use Excel worksheets as databases with many columns and rows of data, the Row to Column Viewer will make the management and review of the data easy and save you time. If you click on the up or down buttons, this will change the contents to the next visible row up or down. You can click on any cell while the dialog is displayed and edit the cell's contents! To update the dialog's list boxes, just double click on a blank area of the dialog. This technique also lets you easily update the list boxes for any row - just click on the row and then double click on the dialog to update the contents! One of our favorite options(found at the top right of the above dialog) is the one to show the cell entries on the current row and the next visible row below it. It is a great way to compare two rows, especially if these rows may be duplicates.